It really depends on how large that right-side section of the room is. I think this would have to be a very large bedroom for it to work. It seems like using the space in the left-side would be more ideal but I imagine there's something there to prevent you from using it? Note the specs in the wiki for camera FOV and suggested distance from the subject. I think PS3 Eye is 70mm, but not sure at the moment what the minimum distance-to-subject is. PS3 Eye can be positioned pretty far from the subject, which is great in a large space but it's less effective in a very tight area, especially if you're attempting a 360-degree capture. Basically, all of the cameras need to be able to see the entire body most of the time for iPi Mocap Studio to track it accurately. You'll also need to be sure you can light the subject evenly (i.e., no hard shadows), which is harder to do if you're near a wall. If this is actually a very large bedroom and you have good ambient lighting, I guess it could be okay. I had reasonably good capture quality with four PS3 Eyes in the past. I'm not sure how good the results are with only three cameras. Well, that's $50 down the drain! I might as well try the dual kinect method in the future! Thanks for the help guys! Mods or admins. Feel free to lock this topic! You're not following the process and setting the iPi Actors colors to what you are wearing, that's why the Actor balls up. The rear cam for a 3 cam set up should be placed to your left side rear wall, you will still be able to track rotations that way and be able to move back a bit and get more action space. Try again, but reset that cam and detect the colors properly and set the skeletal parameters to match your body. There is no reason I see you shouldn't be able to get a recording to track in that room, limiting factor would only be the 3 cams. Testing of a minimum 3 PS Eye set up to show there should be no "real issues" in recording and tracking 360 degree motions. Used dimmer ambient lighting letting the program set the gain with Auto-Gain, then turned it off for recording. I just wanted to see how 3 PS Eyes would record and track under these conditions, though the tracking did loose Actor arm connection in a few spots, a simple re-track of the area corrected things fine. Any small issues viewed can be quickly cleaned up right inside iPi, I just wanted to demonstrate a 1 Pass Auto Clean. Used 3 Moves, Head and Hands, didn't add finger animations for this test. Last edited by Snapz on Mon May 14, 2018 10:05 am, edited 1 time in total. That looks very good for three cameras. Great test! Yeah G, I was also expecting more tracking loss, but it fared well, as I get about the same even when using 6 cams at certain points, especially on extreme motions, but never that many anyway, and I can clean it up easily right inside iPi, which I like, but knowing there is always post 3D package editing to do later anyway. It is cloudy here today with rain, and I purposely only used 1 small wattage light and the light source from my windows, which was also dimmed by the cloudy day, so the recording had more graininess, which is common for dimmer light, but had no real affect on the tracking. The cams were set up in a 12 ft wide x 15 ft length space, same as I use with 6 cams, I just turned 3 off and it still covered the same volume on the floor as 6, I just didn't have the higher 2 front cams, which do track the feet better to the floor, but it wasn't too bad during tracking, I am also familiar with how the program reacts, so was easy to correct it. Just wanted to test 3 cams so the OP could see 3 cams will track pretty good, even in the room he has should be similar. I hope I'm not jinxing myself but I'm finally getting back to using iPi again this week. Expect to start posting stuff again soon. I was hoping for the left rear of the wall. 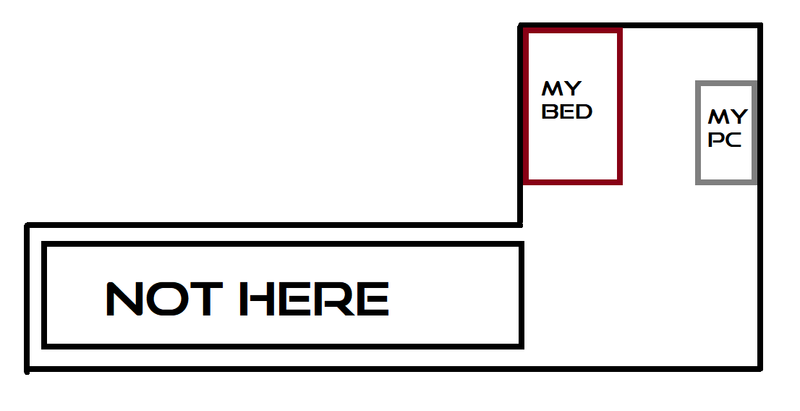 But My mom won't let me do that because that part is not the part of my bedroom. Got any other camera setup ideas? Like a schematic for this? I have a base schematic for this room! If you guys have ideas for a proper PSEye cam setup. Plz let me know! There is not really a capability for correct 360 tracking without using that side of the room IMO, I mean it is just 1 small camera, how much could that hurt, make it so it can be removed when not in use maybe, using the 3M strips that have velcro in the middle and won't damage the wall when removed and a small type L bracket to hold the cam? (L brackets will need to be rotated down a bit on the wall to get proper cam view). The rear cam you had could possibly work if moved as close to the off limits side as possible, you would have to test it though. It's too tight to use the set up I did I think, (layout is shown in videos), you need at least 12 ft wide room and at least 15 ft length, (maybe a little less width and length, but would cut down on usable area too), but it would allow more view for the front cam with the L shaped room and to move forward a bit more for a little more rear area, not sure, would be a trial and error set up to see what you can pull off. One other thing for clothing is to wear light material dark gloves, it helps with arm tracking, with a more prominent color T shirt, and the use of hand Moves, and a head Move is recommended for best accuracy results, (Head Move with PS Eyes is optional, but will help). Also, keep the light out of the camera lens as much as possible, use a solid shield to block the light and direct it to only the capture area if needed. You will also have to learn the tracking process with PS Eyes, you won't get a 1 pass, no errors track, but let the program do most of the work, either by re-tracking failed areas, or manually making corrections if needed, and always run the Refine tool! I use the Jitter removal process set to 1 on all bones, except the head set to 5, and 1 on the Trajectory Filter setting, and use Flexible Spine setting for most common motions, Very Flex spine is more for high energy dancing, or possibly a high energy fighting motion where hips would be in constant motion throughout the action, seated action works better with the Stiff Spine setting. Replay of animations set the Trajectory Filter higher, 3-5 depending on look. Use shoulders by video and head tracking on, set that before you refit the Actor. Just a couple tips I use, hope they help. Good Luck, I hope you can make it work out! I looked more at your "down the drain" video to get a better idea of the room, it looks like how you had it, 2 cams front corners, 1 cam back right corner should work ok, probably moving rear cam up as high as possible, you can hang it upside down to get more height using the upside down option in cam settings. You would need to mark the spot you want as center floor point on the floor with something, then align the center line with the grid tool, so cams all run through that mark, trying to make the center grid mark to align with the performers hips as close as possible, doing that will give you a little more space behind the performer on the floor. Reset the rear cam and give it another try, because it looks feasible to me, since limited on use of rear wall. Carpet looks a bit dark, but hard to tell from video, if it will conflict with the dark pants and shoes, it may cause tracking issues, but change the floor color using a solid lighter color throw rug, keep using the darker pants and shoes, as it will track better.